For those of you that don't have a coffee background, iced coffee is basically double strength coffee. And if you want to be real legit, you will cold brew your double strength coffee, rather than hot brewing double strength coffee. The cold brew way takes more time, but it also makes the coffee taste more smooth, as it removes some of the acidity from it. We cold brew. It tastes better and besides the wait time, really isn't any harder. What we use at home to make our iced coffee is a Toddy. 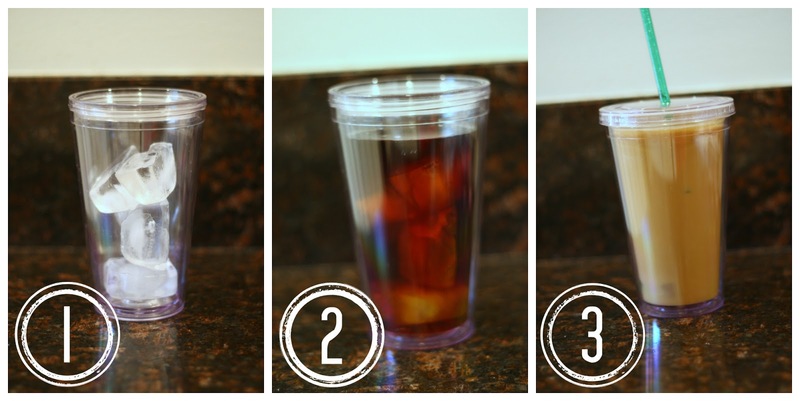 It's a cheap and easy to use system for making iced coffee. The Toddy system comes with five parts - brewing container, reusable filter, rubber stopper and a glass pitcher with a lid. To make iced coffee, there are only two ingredients - coffee and water. We use about a cup of whole beans for each batch of coffee. And though we now use home roasted coffee beans, I also recommend Trader Joes smooth and mellow coffee for iced coffee. But back to making the coffee. All that is needed for the Toddy is a cup of beans and the Toddy pitcher full of water. 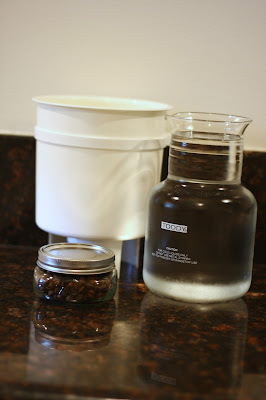 You will want to put your rubber stopper in the brewing container, then put in your reusable filter. On a side note, you have to store your reusable filter in the refrigerator or freezer...random, right? And I realize our filter isn't a pristine white any more, but the two filters the toddy came with have lasted two years. Next you want to grind your beans. You want the beans ground pretty course, like for a french press. Then you are going to put about half your water in the brewing container. Top it with about half your grinds and allow the grinds to soak into the water themselves. DO NOT STIR IT. Then you will repeat the process by adding more water and more coffee grinds. 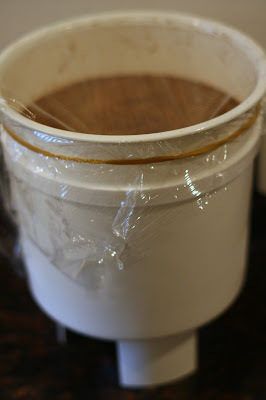 Once you are done, top with some cling film (you know, to keep flies and small people's hands out) and a rubber band and let the concoction sit for 24 hours. 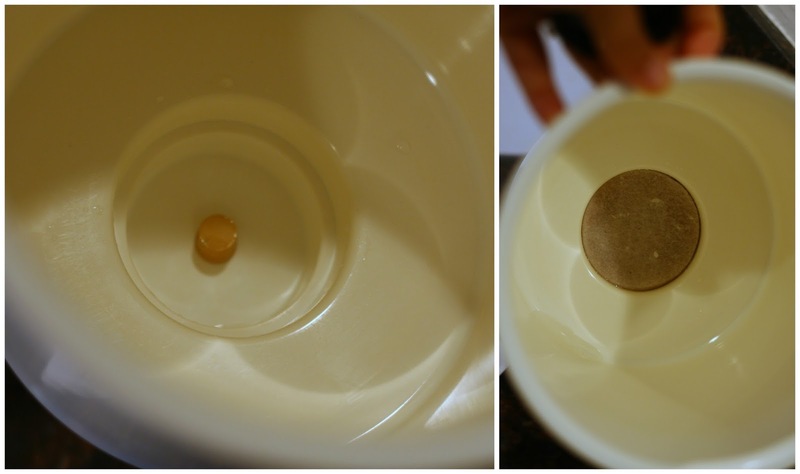 After the 24 hours, while holding the brewing container over the pitcher, pull out the rubber stopper. Then set the brewing container on top of the pitcher and allow the coffee to drain into the pitcher. And, tada, you have yourself some amazing tasting iced coffee for way cheaper than Starbucks. And for you, a little tip. 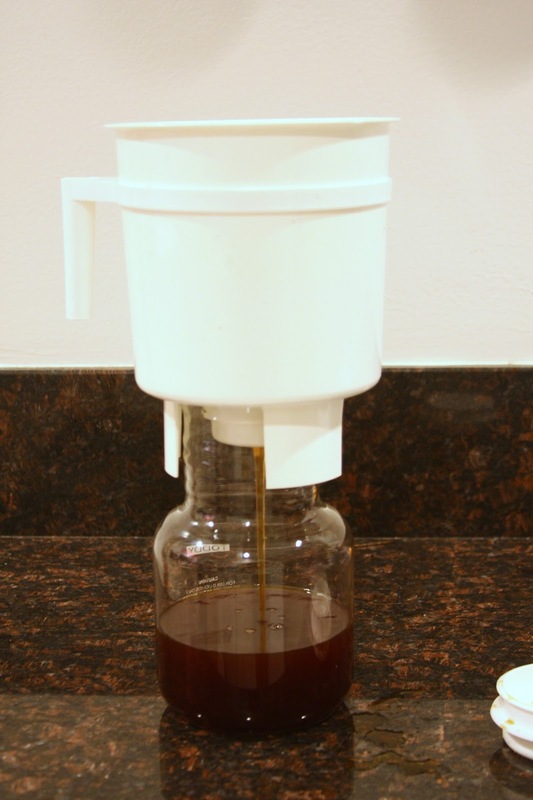 Since the pitcher isn't required for the brewing process, when you find yourself running low on iced coffee, start a new batch brewing, so it is ready when you run out. Ian and I both drink our iced coffee the same - no sugar, but with a little cream. I prefer to drink my coffee with a straw and the reusable iced coffee cups are my favorite. I've used ball jars before, but I prefer the coffee cups because they have lids AND fit in the cup holder in my car. And just to confuse you a little more, you can also do this method with a french press...using less coffee and water obviously. Just make sure after the 24 hours is up to not store your coffee in the french press with the grinds. Also, you will want to filter it again just to make sure all the grinds and grit are out of the coffee as the mesh filter in a french press doesn't do an amazing job. So now that you know how easy it is, save yourself some money and start making your own iced coffee. But don't blame me when you find yourself drinking way more than you should! 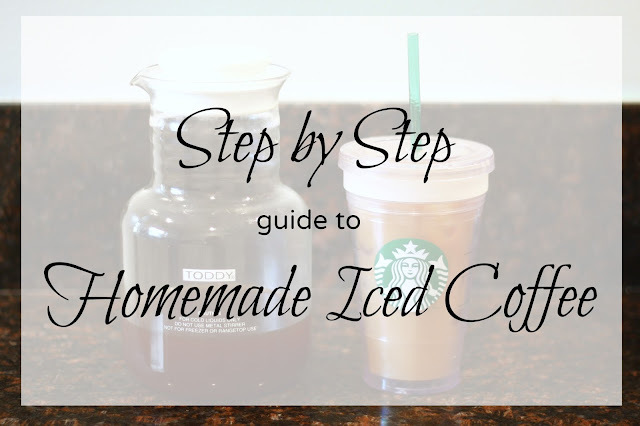 And if any of you out there currently make your own iced coffee, I would love to hear about your methods.